I am sure that I am not alone in observing how little has been achieved at Cefn Onn park since the announcement of the very substantial HLF grant in March 2016. I am led to believe by officers at Cardiff Council that no substantial works will commence before the Spring of 2018. 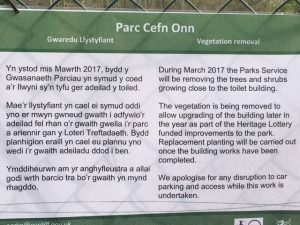 This really does reflect very badly on the persons responsible for implementing the schedule of works which were approved in the submission to the HLF, and I am sure that the Friends of Cefn Onn park are equally dismayed at this lack of progress as all those people who use the park on a regular basis. The (painfully slow) appearance of an additional notice board at the entrance to the park will, I am led to believe, contain a plan of the works to be carried out next year. Would it not have been a better use of funds to make this information available on a website at least six months ago? I should emphasise that these comments are not in any way intended to detract from the fantastic work carried out by the Friends of Cefn Onn; their enthusiasm and commitment to improving the park are inspirational. Let’s hope that the relevant department at Cardiff Council will now get on with the work and bring to a speedy end the procrastination of the last twenty months.